If you’re looking for variety, look elsewhere. 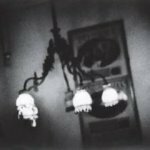 Almost every song begins and ends in the same moderately slow tempo, includes some variation of fingerpicked or delicately strummed guitars, and features Mark Kozelek’s understandably haunted vocals over the top. Did I mention the songs are long? They take a while to never really get going, but that’s clearly the intent. I admit I don’t know what to make of it. On the one hand, I enjoy the grand conception that allows Kozelek to stay in his (slow) groove for so long, never seeming rushed and milking the plaintive atmosphere for all it’s worth. On the other, I suspect you either get hooked by this or you don’t and after several listens I fail to be seriously moved. I contrast April with a similar album that follows its own rules and rarely varies in tone, Nico’s Marble Index, which never fails to move and disturb me. Perhaps its Nico’s profoundly unsettling voice, or John Cale’s nervous breakdown arrangements, but any three seconds off that album will not fail to get under my skin. The fingerpicking here creates a similar staccato vibe, but the emphasis is on relaxed beauty instead of dissonance. And much of April is quite lovely. Sure, it sounds like one long song to me, but it’s a nice song, with subtle variations. The album sounds perfect for a campfire, just be sure to bring plenty of wood. The first track, Lost Verses, with chords from the Allmans’ Melissa, clocks in at close to 10 minutes. To call it a highlight is perhaps to differentiate it too strongly from the remainder, which frankly sounds the same. This is one of the reasons the expansive song lengths are not a problem, because song runs into song and it hardly seems to matter where one ends and the next begins. You might imagine that the music is a setpiece for some soul-baring lyrics, and you’d be right. Kozelek may or may not be the happiest man on earth, given his harrowing upbringing, but his mopey voice and troubled stories suit the emo ethic perfectly. So it’s not surprising that the response from the terminally depressed and self pitying critical establishment is nearly universal praise. I remain fundamentally unconvinced. Not that I actively dislike this record. Much of it is haunting and insistent, and the lyrics have some nice turns of phrase, but the over-earnestness is an issue, as is the lack of irony and humor. The fact that Kozelek has apparently published a book of his lyrics is another troubling indication of the seriousness at work. Didn’t Jewel do something like that? Lost verses welling up his eyes and ears is a nice resonant image, but “the lone mandolin strums”? I demand a little more from my poetry than that. And I wouldn’t be making such a big deal about the lyrics if they weren’t such a crucial part of the album’s plea for greatness. I’m still going to recommend it, but I’m not going to enshrine it.